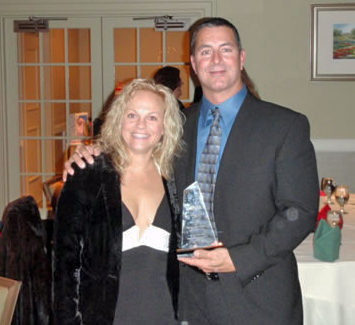 Richard Cannavino and his wife, Sharon, showing off the 2007-2008 Home Builder of the Year award. Cannavino Construction received the coveted “Home Builder of the Year” award by the Northern Illinois Home Builders Association (NIHBA). The firm was selected from over 450 members. “It is a true honor to be selected into such a prestige’s group of Home Builders”, said Richard Cannavino, president of Cannavino Construction. The award has been given to the outstanding Builder of the year, marking the 52nd year of the NIHBA. “It is a matter of paying attention to the details throughout the building process”, stated Cannavino.